Yesterday the European Space Agency successfully landed the Philae lander on comet 67P. Anyone can appreciate that it’s an astonishing technical achievement, but a recurring theme I have noticed on various news article comments and discussion boards is that there’s a significant proportion of the population who just don’t see the point. “What a waste of time and effort”, “that money could have been used better elsewhere”, and a host of similar criticisms. This kind of response is, sadly, rather common in a number of areas (similar comments can be found relating to almost any scientific endeavour that is not directly applied science; the LHC, animal behavioural studies, the whole of astronomy, and so on). In fact, it sometimes feels like it applies to any scientific achievement which isn’t directly contributing to either curing cancer or the development of hoverboards. It’s part of a wider issue too. This all relates directly to the diminishing value placed on pure vs applied research. Some politicians seem to be devaluing science to the point that if a 3 year research project does not produce a commercially viable discovery at the end, it’s not science worth funding. Grant application forms now routinely ask researchers to state what they’re going to find. Just think about that for a moment. While there is certainly merit in having a coherent plan in much of research, we are also missing opportunities to just see what this thing does. Blue skies research is vital, but neither politics or journalism work on the same timescales as science, which leads to a significant disconnect with the public and policy makers. The idea of investing in research now which may not see application for decades is anathema to many. It doesn’t fit with the money-in results-out sausage factory that people often want or expect. The Rosetta mission, and Philae lander in particular are a case in point. A probe that was launched 10 years ago, lands on an isolated comet in the middle of nowhere, and all people see at this point is that there’s some kerfuffle in the news, and a picture of a rocky ice-cube. They see the cost in launching the mission, and they see a single photograph as a result. They do not consider the impact of the science mission here on future research. They don’t even necessarily understand that this event marks the start of the scientific mission, not the completion. They ignore the technological developments in launching a mission like this, and how engineering solutions from missions like these feed their way back into normal life. They do not necessarily appreciate the enormous potential for this mission to feed into our understanding of our solar system, its formation, and the planet we depend on for our survival. 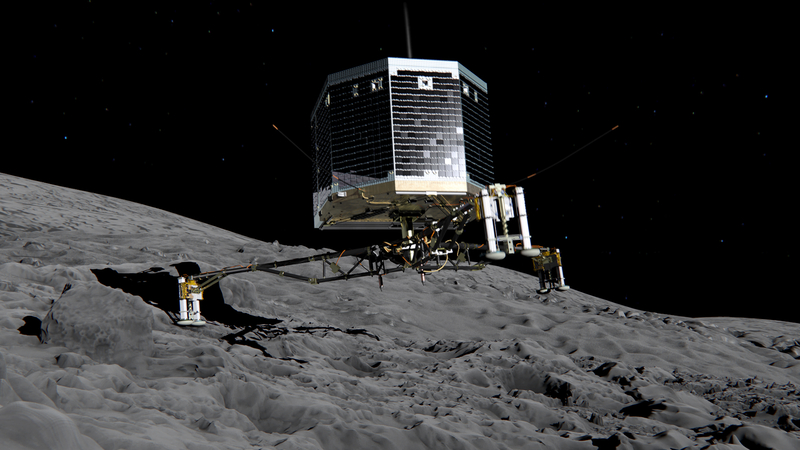 Artists impression of the Philae lander on touchdown. Courtesy of ESA. The argument that really gets me is when people complain about the wasted money. These complaints suggest that projects take the cash value and somehow ‘use up’ all the money, for it never to be seen again. This naïve economic assessment ignores the entire process of spending. This money doesn’t get incinerated on the Bunsen burner of science; it gets paid as salaries, and spent on equipment and services. It gets spread around to a huge range of high-tech and support industries which are essential to cutting-edge research – precisely the kind of industries that governments are desperate to encourage. The kind of employers that parents hope their children will get to work for. The kind of companies that encourage education and investment in people. And then there’s the support and administration staff that every research department and hi-tech firm relies on. The salaries paid to all of these people get spent on food and bills and clothes and all the usual trapping of life. That grant money also draws in more external investment. In short, the money spent on science research not only gets pumped straight back into the economy; it boosts the economy, and even has the potential to unlock new discoveries and new engineering solutions, which lead to new products, and maybe – just maybe – the technology to make a working hoverboard. That’s not to say that applied research is somehow the poor cousin to the more blue-sky projects – it’s not. But it is essential that we push the boundaries wherever we can see them. The man or woman who invented the wheel did not envisage trains or motorbikes, but their experiments with roundness and diameters laid essential groundwork. All of science builds on the foundations of what has gone before, but blue sky research forms the scaffolding and framework around which towers can be constructed. So please, next time you see someone making the ‘applied research is the only necessary research’ argument, point out that they are suggesting the equivalent of navigating through a mountain range by only looking at the step in front of you. This entry was posted in Astronomy, General, Geology, News, Science and tagged comet, ESA, Philae, Research, Rosetta, Science, science funding. Bookmark the permalink.